The Stroop task is one of the most popular cognitive psychological tests. Because so many people know it, it is probably good to know how to code it in PsyToolkit. In the original Stroop task, the time to pronounce words is being measured. Here we measure responding button presses. That is, this is a modified version of the original. For this experiment, we need a number of stimuli. You can make these with Inkscape very easily (see stimulus creation). Here are two examples from those, namely the "instruction2.png" and "yellowred.png"
The stimulus "yellowred". This is actually a png file, but because PsyToolkit uses png as the default format, you do just use "yellowred" in your bitmaps section and it will assume there is a file yellowred.png. As you probably already know, the Stroop task is more difficult than you think. Try it for yourself in the lesson. stroop 40  # run the stroop task 40 trials. It is very important to use the empty lines appropriately. Different sections in a PsyToolkit script must be separated with an empty line. If you forget that, or if you add an empty line somewhere in the middle of a section, you will get an error message! In the bitmaps section, each line contains the name of a bitmap that you will be able to refer to in the rest of the code. If you use png files, the computer will automatically assume that there is a corresponding png file. You can use a second argument on each line to specify the exact file, or a file in a different bitmap format, such as jpg, bmp, gif. The table is the most convenient way to specify the parameters of each experimental condition. For each condition, you have one table row. In the later code, you can refer to a column with the @ sign (see below). In the current example, there are 3 columns. The first colum specifies a human readable text which is just for humans, the computer further does not interpret this, but can add it to the output data file (see the save line below). A task describes (typically) all events of one trial. In the Stroop experiment, there will be 40 trials. That means, the computer will "call" this "task" 40 times, and each time, it will randomly select one of the rows of the table (there are different ways of selecting table rows, but this is the default). In the task, you need to specify which table is being used, even if there is only one table. You can have multiple tables if you have multiple tasks. But you can maximally use one table in one task, and which one is being used is entirely fixed. You need to tell the computer which keys are being used for response measurement (unless you do not have normal keyboard input, which can happen in certain experiments). Waiting for the next even. Time specified in milliseconds. Of course. Show the bitmap fixpoint. Everything about the # sign is comment. If no X,Y position is specified, the bitmap will be shown in the middle of the screen (but see the option "origin" if you want to change this). The clear statement removes the stimulus from the screen. The number corresponds to the order of the stimuli within a task. Thus, the 1 corresponds to the stimulus that was being shown as the first. Here, you could instead have used "-1", which removes the last shown bitmap. Now show a bitmap, but which one depends on the table row. It takes the second column of the table, and the table row is chosen randomly each time the task is being called. That makes that a different bitmap will be shown each trial (unless you have a trial repeat, of course). This tells the computer to wait for a key press. It expects that the correct key is the one specified in the third column of the current table row, and it will maximally wait 2 seconds for a key press. If no key had been pressed within 2 seconds, the computer will just go on and put the STATUS to TIMEOUT. If the correct key has been pressed withing 2 seconds, the STATUS will be set to CORRECT (which has value 1). If the incorrect key has been pressed, the STATUS will be set to WRONG (or 2). The TIMEOUT status is equal to value 3. The readkey sets the STATUS variable. There are three values, which can be written as CORRECT, WRONG, and TIMEOUT, or as the shortcuts, 1, 2, 3. This keeps the values you want in the output data file. Only this information is kept. You need to tell the computer what is being kept for later analysis. The message instruction just shows the bitmap and waits for a key press. This is perfect for intro screens. The block instruction is needed to have psytoolkit do something. Just specifying a task is not enough. The task merely describes what happens in a trial, but the block and tasklist statements tell the computer to actually do it. In this case, the stroop task will be done 40 times. The default way of working is that each time, one of its table rows will be chosen randomly. There are different ways (e.g., you can have a fixed order, or one in which each trial is only done once before any other row is being chosen). 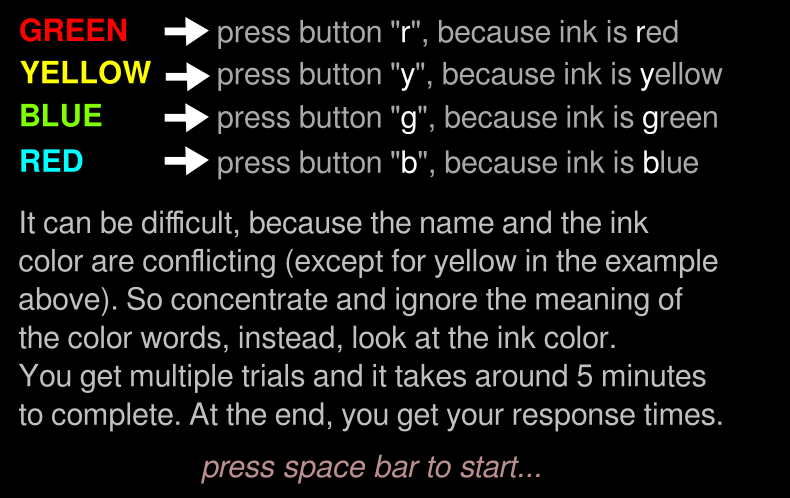 Here is a lesson about the Stroop task using a somewhat extended version of the code explained here (for example, above is no online feedback built in). Click here.